Kiran is informed about the forced ranking of 200 managers’ performance at Bridgewater Associates, the largest hedge-fund in the world, with $150 billion in managed assets. He had just completed his first year at Bridgewater, and it was rough. Until now, he has had a stellar career; an accomplished doctor working for the World Health Organization. A consultant at several top global firms. Kiran has never failed like this before. When you get criticised - from your boss, from colleagues, or from friends and family - it is unpleasant. You feel hurt. To understand why, let’s take a look at what’s happening in your body. Negative feedback activates the ‘amygdala’ region in brain, the area responsible for core survival instincts and memory. In a millisecond, your brain releases chemicals like adrenaline, catecholamines, and cortisol, affecting your central nervous system. They prepare you to ‘fight or flight' from the danger. Your blood pressure rises, heart beats faster, and your rate of breathing increases. 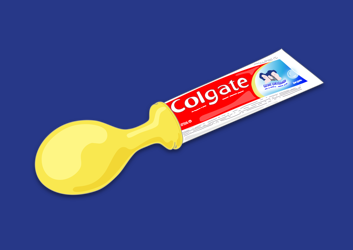 Your face may flush with increased blood flow. Your attention narrows and becomes focused on one thing. In short, your body is preparing you for action. The active amygdala immediately shuts down the neural pathway to our prefrontal cortex which has analytical, reflective brain power. Thus, complex decision-making disappears, as does our ability to analyse multiple perspectives. As our attention narrows, we find ourselves trapped in the one perspective that makes us feel the most safe: “I’m right and you’re wrong,” even though we ordinarily see more perspectives. When the amygdala hijacks your brain, it becomes reflective, and all learning shuts off. This is exactly what happened to Kiran: He was embarrassed. But at the same time he was also excited. And even a bit proud to get publicly criticised. So what is happening? Kiran explains his story in a podcast Worklife by Adam Grant where he shared the unique corporate culture of Bridgewater. The unique culture of Bridgewater explains how Kiran was able to handle criticism and use it as an invaluable opportunity to learn and improve. At the moment of getting the criticism, Kiran managed stay reflective and not giving in to his amygdala. How? Because his firm had adopted this technique into it’s core corporate culture. In fact, founder and CEO Ray Dalio built Bridgwater on the principle of “Radical Truthfulness” and “Radical Transparency”. Employees are encouraged to openly challenge one another, and they are given tools to facilitate the collection and sharing of this data: proprietary feedback software they call ‘Dot Connector’ (see above). One of greatest tragedies of mankind is people arrogantly, naïvely holding opinions in their mind that are wrong, and acting on them, and not putting them ‘out there’ and ‘stress testing’ them… At Bridgewater we start to see things through other people’s eyes, and see things collectively. 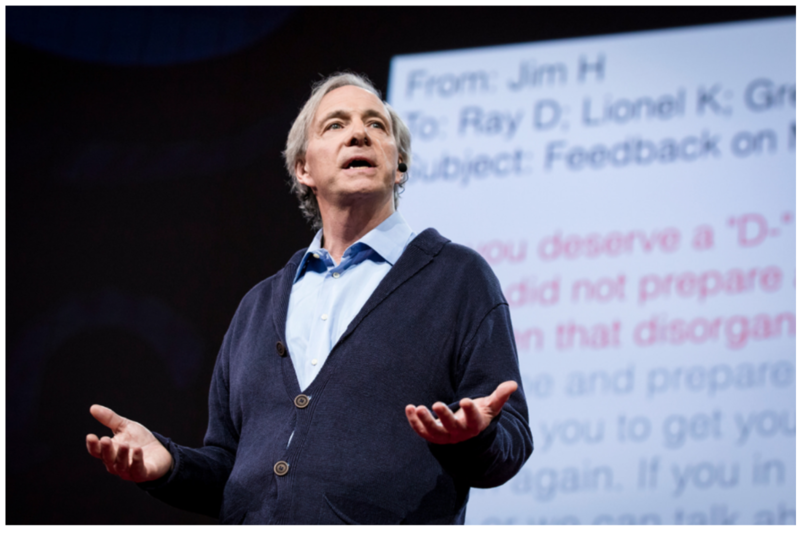 Ray Dalio, one of the world's 100 wealthiest people, successfully leverages continual group criticism. When the amygdala is in charge, we miss out on the benefits of honesty and criticism. Ironically, neuroscientists tell us that the more developed area of our brain - the prefrontal cortex - actually likes this sort of feedback. So feedback presents a ‘battle’ between your emotional and your intellectual brain. And as Ray says, “…we win this battle as a group”. Creating a culture that embraces criticism and transparency in a group setting trains employees to not focus on the typical feedback “scores” we tend to receive, but rather on how we react and respond to the feedback. Are you able to reflect on criticisms and actually make productive steps forward? Or are you worried about protecting your image and preserving your ego at all costs? Xebia, the leader in Agile transformation services, is well aware of this problem. If teams are better equipped with constructive feedback their outcome will skyrocket. Xebia accompanies their clients in their transformation to agility. This journey starts with ‘Doing Agile’, followed by ‘Becoming Agile' and finally arriving at ‘Being Agile’, a state of ultra high performance, continuous improvement and high adaptability. This is where feedback - or the lack of it - comes in. Agile coaches start helping team members in learning how to provide and receive positive and constructive feedback. This feedback is crucial in helping a team take the next maturity step. Feedback between team members, feedback with management, product feedback from customers, feedback everywhere. Some team members seem to have a natural talents at feedback, and can pick it up quickly. Others, not so much. It depends on personality, position in the team and other factors. One important team factor is ‘safety’. How comfortable does a team member feel to give and receive feedback? How empowered is the team to self-organize and help each other, instead of satisfying (individual) management commands? 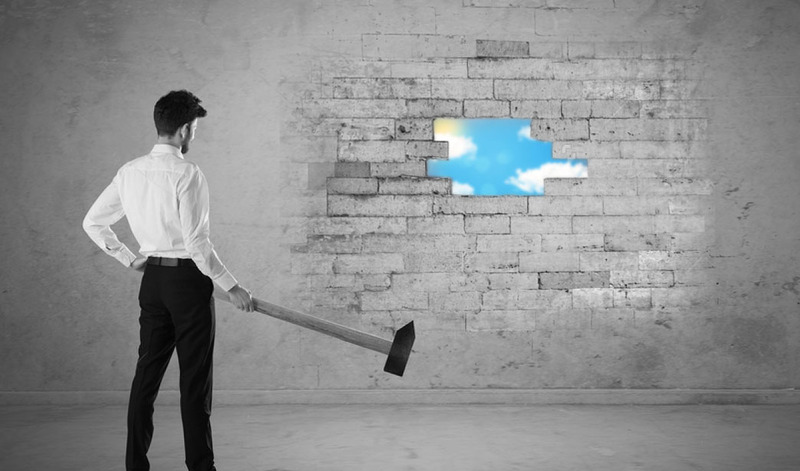 For most companies that are in transition, failure is not an option. This is often a point where coaching can take longer before results are observed. The WeQ Feedback Game has proven to be an accelerator for Xebia. It is a tool to boost initial feedback success. Xebia has seen teams open up instantly after having played the game. They now know what it takes to deal with feedback. The traditional approach for shaping teams is based on the belief that simply putting together a bunch of the best or the smartest individuals will automatically result in a top performing team. This leads companies to focus on the individual attributes of each team member. They might invest resources into analyzing employee personality traits using tools like Myers-Briggs test, and assigning each employee a personality “color”. However the scientific community has serious reservations whether such individually-based tools deliver a real benefit to overall team performance. Instead, leading institutes like Gartner and Harvard University are funding extensive data-driven and scientifically proven factors that determine top performing teams. Their findings support the hypothesis that the connections and interactions in a team are more important than the individuals. Even more convincing, Google’s ‘Project Aristotle’ analysed over 200 teams and concluded that it matters surprisingly little “who” is on a team, but rather the dynamic and collective intelligence of the entire group. As a consequences, leading organizations have begun shifting resources to provide effective social norms, and to establish higher levels of what they call ‘psychological safety’. WeQ created a tool that synthesizes all these scientific findings into a ‘gamified system’ where the whole team can boost their collective intelligence. The game mechanics are built around helping teams to accomplish three core tasks: Remove cognitive biases, promote constructive feedback andbuild psychological safety. Any team (up to 10 people) can accomplish these objectives through a session of fun game play. A Certified Master Coach guides the interaction using the WeQ system, which includes a mobile app, a board game, and reports. Xebia is convinced that solving feedback can unleash success for their clients, and reached out to WeQ to develop a partnership where they can test the system. Together with Xebia’s agile coaches, WeQ has run several facilitated sessions for teams at ING, KPN and Ingenico. Here’s how it works. Step 1 - Know your team’s status The team assesses 12 key indicators on team dynamics using a questionnaires derived from research by Harvard Professor Amy Edmondson and other scientists. 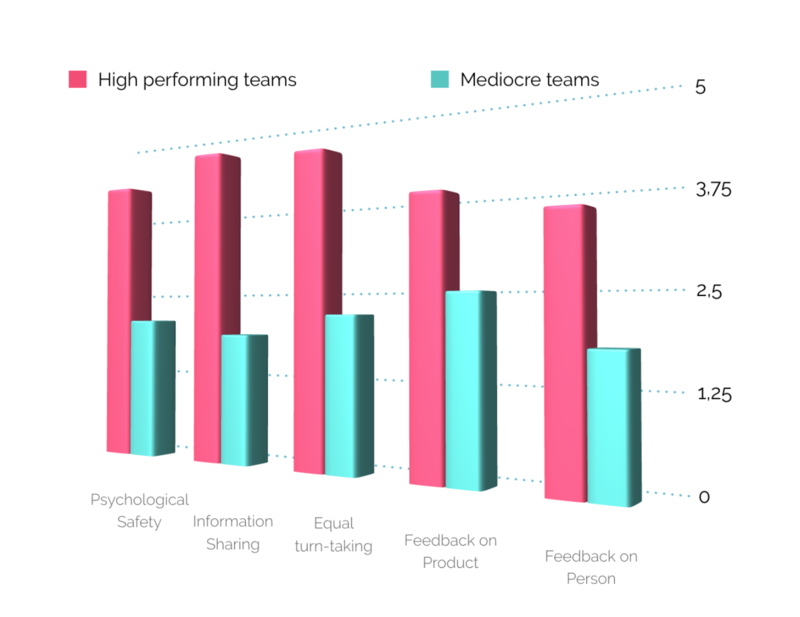 The team rates several things like the extent of current psychological safety, the information sharing style, the feedback behaviors and few other key metrics. During the Pilot period WeQ collected data from more than 100 professionals from 13 teams. Giving feedback about colleagues’ behavior is far more challenging than exchanging feedback about product or businesses. 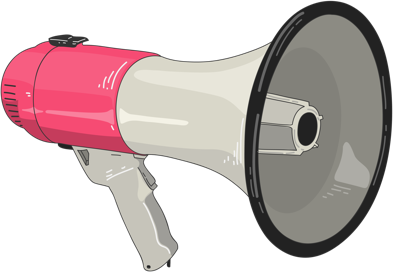 - Team members are hesitant to openly share information, sometimes they hold it back for own benefit. - This baseline gives the team a clear direction of how to tackle their weakness. Step 2 - Let the games begin! 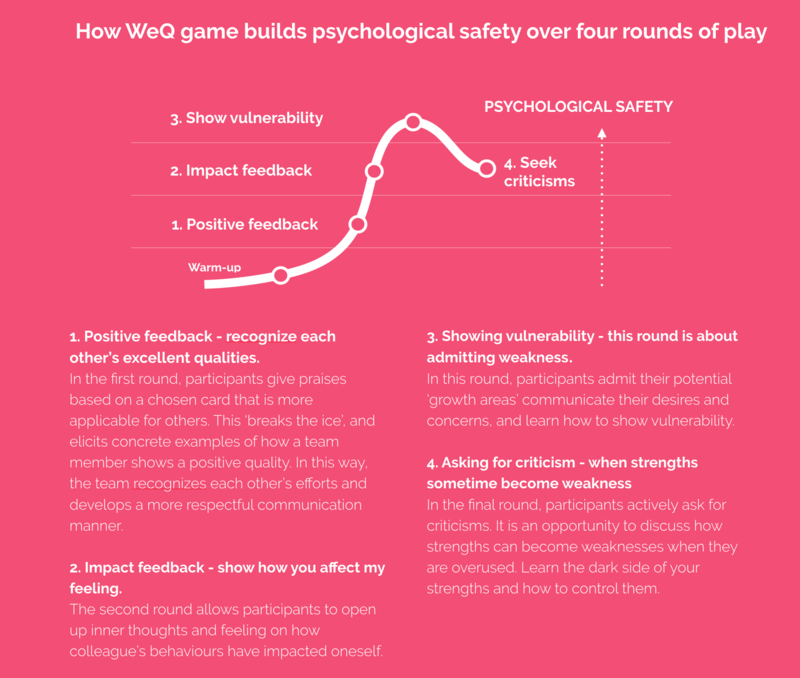 WeQ’s game mechanics unfold in four phases: It all begins with providing praise, which kicks up a lively and compassionate conversation. Through the course of gameplay, successful teams can build up sufficient safety, respect and trust, and advance towards a ‘final round’ where participants are actively seeking tough but honest constructive criticisms. When the game session is completed, participants reflect on their WeQ experience and discuss key takeaways. 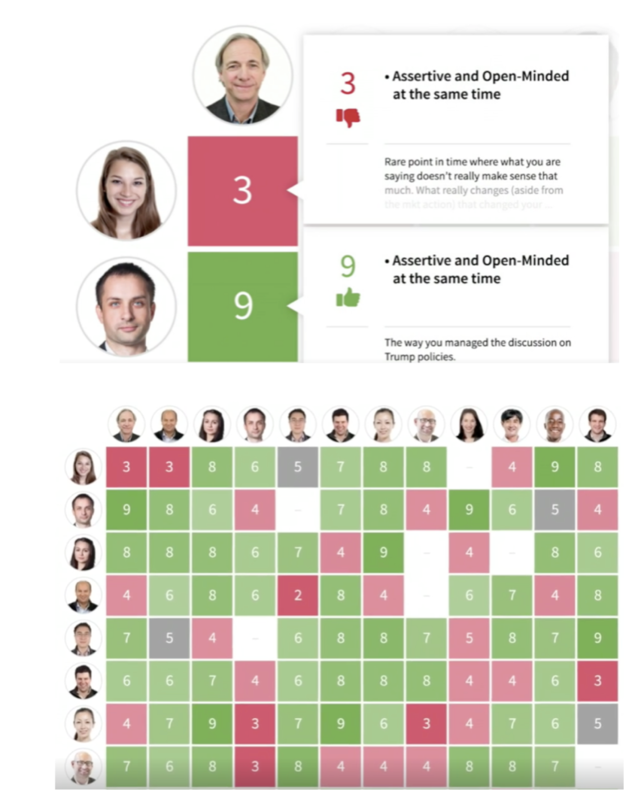 A visualization of team’s feedback scores is an effective way to facilitate the reflection. Team members clearly identify their strengths and weakness, thereby giving each other an opportunity to improve the things that really matter the team. By repeating WeQ session with different teams, it was discovered that the game experience reliably provides evidence that help teams better deal with criticism and constructive feedback. 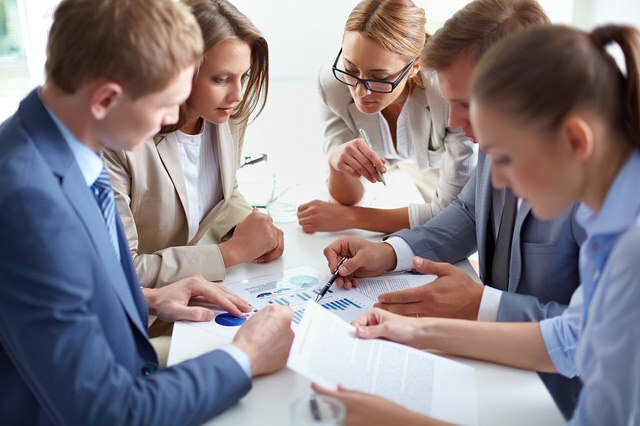 WeQ is a proven system to boost collective intelligence of any teams. 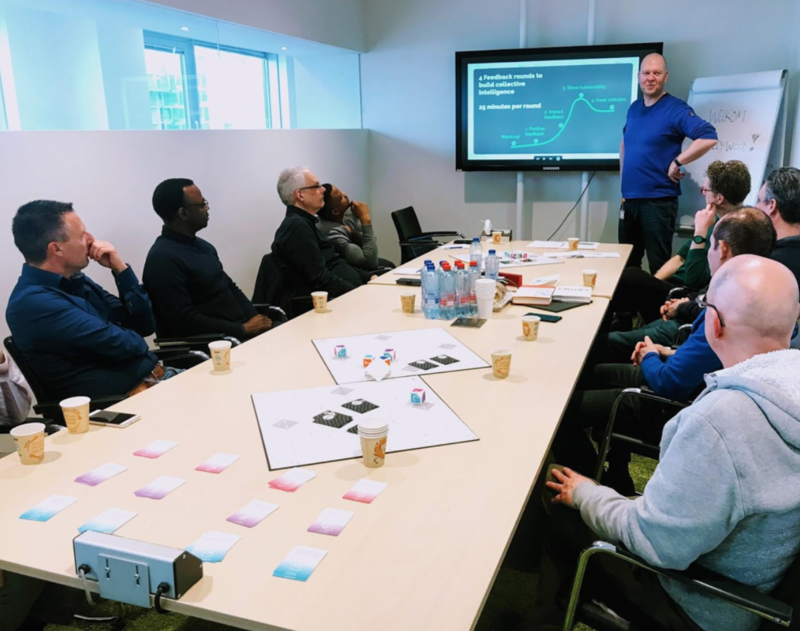 For agile coaches at Xebia, it becomes an essential toolbox to create immediate results — more effective communication, enhanced psychological safety, and mature feedback behaviour in the team. 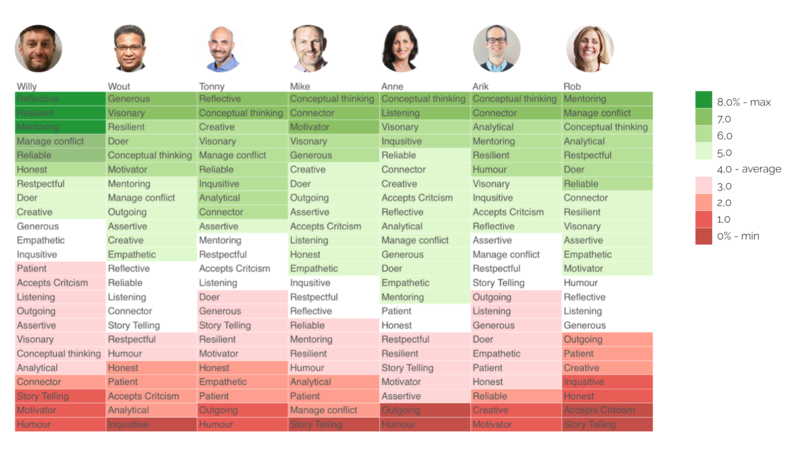 Extracted from WeQ Report - Team members’ character skills ranking based on the feedback. All data is public.